Post interesting news from gun makers and firearm blogs. Alabama Gun Forum is a FREE forum to buy, sell and trade guns, gear and more. Built by gun enthusiast for gun owners to have a place to join talk, buy and sell firearms. Its Free to join and easy to use. 10k rounds of polyfang 5.56,no barrel wear. Remington Arms plans to relocate in Alabama. Alabama Gun Forum is the largest gun forum for Alabama citizens. 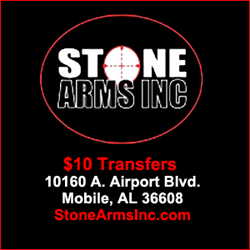 Alabama Gun Forum is locally owned and operated. We offer a free place for people to buy, sell and trade firearms and accessories! Sponsoring Alabama Gun Owners Forum helps grow the forum. You are also recognized with a special title so when you post people see it. Click below to become a sponsor. Forum software by XenForo™ © 2010-2019 XenForo Ltd. Design by: Pixel Exit Certain add-on functionality by LW Addons ©2017 Liam Williams.